What does it takes to make Singapore a truly bicycle friendly city? It is wonderful news that the National Cycling Plan (NCP) targets to complete 700km off-road bicycle paths by 2030. The recent announcement by PM Lee about AMK town to be the test bed for new and innovative ideas for new bicycle town is a concrete milestone as Singapore moving towards a bicycle friendly city. However, is 700km bicycle network enough to make Singapore a real bicycle friendly city? What does it takes to make Singapore a truly bicycle friendly city? Let’s define a bicycle friendly city as a city where you can safely and conveniently use a bicycle to go where you need to go. 400km of the 700km NCP cycling routes are Park Connectors (PCN) which are predominantly for recreational purposes. The remaining 300km are Intra-town cycling routes which are more useful for connecting major transport nodes, town centers and amenities such as food centers and markets. Today we have over 3000km of local access roads in Singapore connecting all the places where people need to go. 300km intra-town cycling routes vs 3000km normal roads. This means by 2030, in average, you have a 10% chance (300km/3000km) to get to where you need to go if you are using the NCP bicycle route. If in 9 out of 10 cases I am not able to use my car to get to where I need to go, I probably won’t drive. Similarly 10% access is not friendly enough for bicycle users. So what does it takes to make Singapore a truly bicycle friendly city? 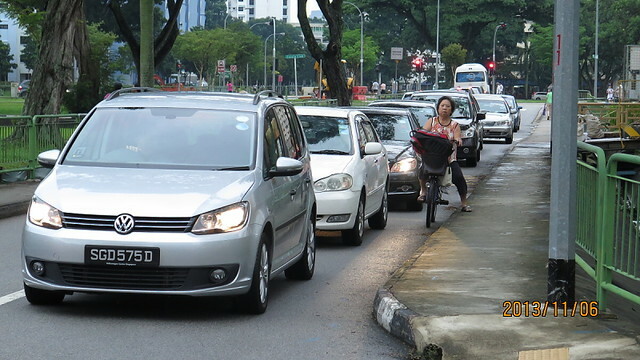 The solution is in fact obvious to many regular bicycle users all over Singapore: as shown here, they use roads as well as pavements and PCNs. The only problem is that it is not safe enough and it does not give confidence to others who would like to try using a bicycle. So what can we do? I’d suggest to dream big, yet act pragmatic and look for “low-hanging fruit” solutions. A) Bicycles, as a transport mode, should take up at least a 30% share**. B) Bicycles should be able to access 90%+ of places people need to go. C) The entire bicycle network must be safe enough for your 10-year-old kid to cycle independently. 1) Lift the ban for cycling on pavements. This will immediately add 3000km of off-road cycleable routes to the network, since most roads in Singapore come with pavements. Simultaneously, introduce a “strict liability law” — in case of any accident between a cyclist and a pedestrian, the cyclist is always liable. Increase the fine to make sure that all cyclists take very good care of pedestrians when sharing pavements. 2) Improve road crossing and road junction design so that it is safe for your 10-year-old kid to cross independently. Without safe crossings, the “network” is not connected. 3) Introduce a 30km/h speed limit for all streets within 3km from each town center. 4) Put a bicycle sign on Bus Lanes. Gradually improve the bus stop design to allow cyclist to pass through a bus stop without interfering or interference from stopping buses. 5) Repaint neighbourhood streets with excessively wide lanes to standard 3-metre lanes. Use the space left to introduce protected bicycle lanes on road. With a pragmatic approach, we should be able to unlock the potential of (off-road) cycling as a mode of transport within a few years, and continuously improve the efficiency and safety of the (on road) cycling network at the same time. **A mode share of 30% share for bicycles will help to increase 33% capacity of public transport as well as 16.5% of road capacity in Singapore. This will be able to justify at least 10% of LTA’s investments to improve bicycle infrastructure. How is that possible? To make it simple, let’s say today transport mode share is 70% on public transport, 30% use cars and taxis. 25% from public transport and 5% from cars shifted to create the 30% of bicycle mode share. This means bicycle will help to relief 25/75, or one third of the loading from public transport, and at the same time 5/30, or 1/6 of loading on cars. What kind of budget will be required to make such improvement possible, even if space is not an issue? Therefore it is a no brainer to spend billions of budget to improve bicycle infrastructure. It will benefits all road users. This entry was posted in Uncategorized and tagged 10% LTA budget, 30% mode share, dream big, low hanging friut on 2014-11-28 by Francis.